5 moles of gas in a cylinder undergo an isobaric expansion starting at 293 K. The cylinder is initially 50 cm tall. The radius of the cylinder is 10 cm and Δy is 1 cm. How much work is done by the gas? (b) the temperature of the gas. For an isothermal process W = nRT ln(Vi/Vf). We are given n, Pfinal, and Vfinal, and we are told that the temperature is constant. (a) For an isothermal process the temperature is constant. Therefore PV = nRT = constant. 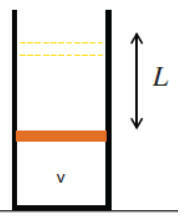 W = nRT ln(Vi/Vf) for an isothermal process. (b) For an ideal gas PV = nRT. 101000 Pa*25*10-3 m3 = (8.31 J/K)T.
A cylinder contains He gas. 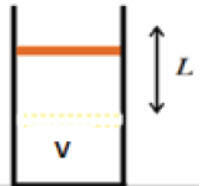 In its initial state a the cylinder Volume is Va = 4.23*10-3 m3 and the pressure is Pa = 1.19*10-5 Pa. The volume is isothermically reduced until the system reaches a state b with Vb = 0.581*10-3 m3. This process is followed by an isobaric expansion which allows the system to reach a state c with Vc = Va. The cycle finishes with an isochoric or isometric (constant volume) process that brings the system back to state a. (a) Draw the cycle in a P-V diagram. (b) Find the work done by the system going from b to c.
(c) Find the work done by the system in one cycle. (d) Find the fractional change of the temperature of the system going from b to c.
(e) When the system goes from c to a, does it absorb or release heat? Find the amount of heat absorbed or released. (f) When the system goes from b to c, does it absorb or release heat? Find the amount of heat absorbed or released. W = ∫V1V2PdV = ∫V1V2nRT dV/V = nRT∫V1V2 dV/V = nRT ln(V2/V1). W is negative if V2 < V1. Since ΔU = 0, the heat transferred to the gas is ΔQ = W.
W = P∫V1V2 dV = P(V2 - V1). If the pressure of an ideal gas is kept constant, then the temperature must increase as the gas expands. (PV/T = constant.) Heat must be added during the expansion process. An isometric process takes place at constant volume. Then W = 0 and ΔU = ΔQ. All the heat added to the system goes into increasing its internal energy. ΔQbc = ΔUbc + Wbc = 4.74*10-7 J + 3.16*10-7 J = 7.9*10-7 J. (c) Wab = nRT ln(Vb/Va) = PaVa ln(Vb/Va) = -10-7 J. Wcycle = Wbc + Wab = 2.16*10-7 J. (e) The system releases heat. ΔWca = 0, ΔUca = ΔQca = (3/2)(Pa - Pb)Va = -4.74*10-7 J. (f) The system absorbs heat. [ΔUab= 0. ΔQab = Wab = nRT ln(Vb/Va) = -10-7 J. We are asked to assume that PVγ = constant, with γ = 1.40. This is an adiabatic process where T and P both increase. Pf = Pi(Vi/Vf)γ = (1 atm)(800 cm3/60 cm3)1.4 = 37.6 atm. PiVi/Ti = PfVf/Tf --> Tf = [PfVf/(PiVi)]Ti. Tf = = (37.6 atm/ 1atm)(60 cm3/800 cm3)*293 K = 826 K = 553 oC. A quantity of an ideal monatomic gas consist of N atoms, initially at temperature T1. The pressure and volume are then slowly doubled, in such a way as to trace out a straight line on the P-V diagram. (a) the work done by the gas. (b) If one defines an equivalent specific heat capacity (c = ΔQ/ΔT, where ΔQ is the total heat transferred to the gas) for this particular process for the above monatomic gas, what is its value? We are given P2 = 2 P1, V2 = 2 V1 and asked to find W and ΔQ. Ideal gas law: PV = NkT, T2/T1 = P2V2/(P1V1) = 4, T2 = 4 T1. W = ∫V1V2PdV = (P1/V1) ∫V1V2VdV = ½ (P1/V1)(V22 - V12) = (3/2)P1V1 = (3/2)NkT1. (b) ΔU = ΔQ - W, W = work done by the gas. U = (3/2)NkT, ΔU = (3/2)NkΔT = (3/2)Nk(T2 - T1) = (3/2)Nk 3T1 = (9/2)NkT1. ΔQ = (9/2)NkT1 + (3/2)NkT1 = 6NkT1. c = ΔQ/ΔT = 6NkT1/(3T1) = 2Nk. Two cylinders A and B, with equal diameters have inside two pistons with negligible mass connected by a rigid rod. The pistons can move freely. The rod is a short tube with a valve. The valve is initially closed. Cylinder A and its piston is adiabatically insulated and cylinder B is in thermal contact with a thermostat which has the temperature T = 27o C.
Initially the piston of cylinder A is held fixed and cylinder A contains m = 32 kg of argon at a pressure higher than the atmospheric pressure. Cylinder B contains oxygen at atmospheric pressure (101.3 kPa). Releasing the piston of cylinder A, it moves slowly (quasi-statically) until it reaches equilibrium. At equilibrium the volume of the gas in cylinder A has increased by a factor of eight, and in cylinder B the oxygen's density has increased by a factor of 2. During this process the heat Q = 747.9*104 J is delivered to the thermostat. (a) Use the ideal gas law and the first law of thermodynamics to show that for the process taking place in cylinder A we have TV(2/3) = constant. (b) Calculate the parameters P, V, and T of the argon in the initial and final states. (c) After equilibrium has been reached, the valve between the cylinders is opened. Calculate the final pressure of the mixture of the gases. The kilo-molar mass of argon is 40 kg/kmol. We are asked to track P, V, and T of two quantities of gas. Ar: V2/V1 = 8, n = 800 mol. O2: T1 = T2 = 300 K, ρ1/ρ2 = 2 --> P1/P2 = 2, since P = ρkT and T is constant. (a) We consider argon an ideal mono-atomic gas. For an ideal gas PV = NkT. For an adiabatic process dU = -dW = -PdV. dU = (3/2)(PdV + VdP). (b) The oxygen is in contact with a thermostat. Its temperature and the internal energy are constant. Since the net work done by the gas in the system is zero, the change in the internal energy of the argon is ΔU = Q. We have for the argon ΔU = (3/2)nR(T2 - T1) = (3/2)nRT1((V1/V2)(2/3) - 1) = Q.
T1 = (2/3)(1/n)(Q/R)(1/((V1/V2)(2/3) - 1)) = (2/3)(1/800)(747.9*104/8.314)(4/3) K = 1000 K.
For the oxygen undergoing an isothermal process we have P1/P2 = ρ1/ρ2. P1 = 1 atm, P2 = 2 atm = 2.026*105 N/m2. From the equilibrium condition we have that for the argon P2 = 2 atm = 2.026*105 N/m2. For the argon P1 = P2(V2/V1)(T1/T2) = 64 atm = 64.9*105 N/m2. From the ideal gas law we now have V1 = nRT1/P1 = 1.02 m3, V2 = 8V1 = 8.16 m3. P1 = 64.9*105 N/m2, V1 = 1.02 m3, T1 = 1000 K.
P2 = 2.026*105 N/m2, V2 = 8.16 m3, T2 = 250 K.
(c) When the valve is opened the gases mix and in thermal equilibrium the final pressure will be P and the temperature T = 27oC = 300K . The total number of kilomoles n is constant. The total volume V of the system is constant. VO2 i = 2*(VAr f - VAr i) = 14 VAr i. The total volume of gas therefore is V = 15 VAr i. We now have P = nRT/V = 2.25*105 Pa = 2.2 atm. A container with helium is sealed by a movable heavy piston with cross-sectional area A. Initially, the piston is in equilibrium, the volume of the gas is V, and the system is in thermal equilibrium with its surroundings. The piston is then slowly lifted by an external force a distance L and held until the thermal equilibrium with the surroundings is re-established. After that, the container is thermally insulated from the surroundings and piston is released. Find the new equilibrium position of the piston with respect to its initial position. Will the piston come to rest or will it oscillate about this position? Neglect friction, the heat capacities of the piston and the container, and the mass of the gas compared to the mass of the piston. The system consists of a container filled with helium gas, which we treat as an ideal, monatomic gas. The container is sealed by a moveable heavy piston. Let us consider three separate states of initial, intermediate, and final. dEint = dQ - dW, Eint = (3/2)nRT, dW = PdV. (1) The system is initially in equilibrium. We can apply the ideal gas law to relate the pressure and volume of state 1 to temperature at state 1. Environment: Penv + Mg/A = P1, where M is the mass of the piston. 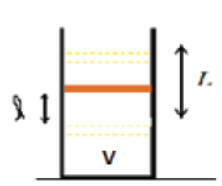 (2) An external force raises the piston to a distance L. Heat is supplied by the surrounding thermal reservoir to keep the temperature constant The change in internal energy between state 1 and state 2 is zero. ΔEint(1 --> 2) = 0. T2 = T1. P2 = nRT1/(V + AL). P2 < P1. (3) The system is now thermally insulated and the moveable piston is released. What follows is an adiabatic process, ΔQ = 0. The piston will accelerate. As it accelerates downward, work is done on the gas, resulting in a change in its internal energy and temperature. The piston will continue to accelerate downward until the pressure P3 = P1 = Penv + Mg/A. Both the ideal gas law and the fact first law for an adiabatic process yield an expression for T3/T1. We equate these expressions to find the new equilibrium position. The ideal gas law implies P1(V + Al) = nRT3, T3 = P1(V + Al)/(nR), where l is the distance of the new equilibrium position above the initial position of the piston. T3/T1 = (V + Al)/V. As the piston falls the first law of thermodynamics implies dEint = -PdV = -PAdl'. (3/2)nRdT = -PAdl' = -nRT Adl'/(V + Al'). (V + Al)5/3 = V*(V + AL)(2/3). V + Al = V3/5*(V + AL)2/5. Al = V3/5*(V + AL)2/5 - V.
If AL << V then Al = (2/5)AL, l = 2L/5. One mole of a monatomic gas is heated in such a way that its molar specific heat is 2R. During the heating, the volume of the gas is doubled. By what factor does the temperature of the gas change? dU = dQ - PdV, where U is the internal energy of the system, P is the pressure, V is the molar volume, and Q is the heat transferred to the gas by the surroundings. For an ideal gas, U depends on the temperature only, U = 3RT/2. Given dQ/dT = 2R, dQ = 2RdT. Therefore (RT/V)dV = (R/2)dT, or 2dV/V = dT/T, or V2/T = const. Therefore, doubling the volume of the gas will increase its temperature by a factor of four. One mole of an ideal gas undergoes transformations that take it from point A to point B on a p-V diagram by two different paths α and β. Points A and B have the same temperature T = T0 (this means that they lie on an isotherm) and the pressure pA at point A is larger than the pressure pB at point B. Path α takes the system from state A to state I through an isochoric (constant volume) transformation, followed by an isobaric (constant pressure) transformation from state I to state B. Path β takes the system from state A to state II through an isobaric transformation, followed by an isochoric transformation from state II to state B. Assume that pA and pB are known. (a) Find VA and VB in terms of the known quantities pA, pB and T0. (c) Assuming that the heat capacities CV and CP are constants what is the heat flow into the gas for each path? Give your results in terms of pA, pB, T0, CV and Cp. In each case is heat absorbed or released by the system? Why? (d) In absolute value, for what process is the heat larger? Why? (a) Ideal gas law: VA = RT0/pA, VB = RT0/pB. (b) Points A and B lie on an isotherm. Here T1 is the temperature of the state with VA and pB. T1 = pBVA/R = pBT0/PA. Therefore ΔQα = T0(1 - pB/pA)(CP - CV). Here T2 is the temperature of the state with VB and pA.
T2 = pBVAB/R = pAT0/PB. Therefore ΔQβ = T0(pA/pB - 1)(CP - CV). Since Cp > Cv, heat is absorbed in each case. |Qβ|/|Qα| = Wβ/Wα = pA/pB. A horizontal insulated cylinder is partitioned by a frictionless insulated piston which prevents heat exchange between the two sides. On each side of the piston we have 30 liters of an ideal monatomic gas at a pressure of 1 atmosphere and a temperature of 300 K. Heat is very slowly injected into the gas on the left, causing the piston to move until the gas on the right is compressed to a pressure of 2 atmosphere. (a) What are the final volume and temperature on the right side? (b) What are the final values of P, V, and T on the left side? (c) What is the change in the internal energy for the gas on the right side? How much heat did it absorb and how much work was done on it? (b) What is the change in the internal energy for the gas on the left side? How much heat did it absorb and how much work was done on it? The gas on the right side is compressed adiabatically. The pressure on both sides is the same and the total volume of the left plus the right side is constant. 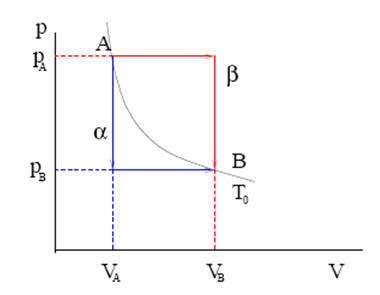 (a) Since the compression is adiabatic, PVγ = constant. For an ideal monatomic gas γ = 5/3. Vf r= Vi(Pi/Pfr)1/γ = 30 liter * (0.5)3/5 = 19.8 liter ≈ 20 liters. From the ideal gas law Tγ/Pγ-1 = constant, Tf r= Ti(Pfr/Pi) γ-1/γ = 300 K * 22/5 ≈ 396 K.
(b) The mechanical equilibrium implies Pf = 2 atm, the same as on the right side. Vfl = 2Vi - Vfr ≈ 40 liters. Then, from the ideal gas law, Tfl = 300 K*(PV)fl/(PV)i ≈ 800 K.
(c) ΔU = (3/2)nRΔT. nR = PiVi/Ti. ΔU = (3/2)PiVi(Tfr - Ti)/Ti ≈ 14.4 atm-liter. The gas on the right side did not absorb any heat, since it was compressed adiabatically. ΔQ = 0, ΔW = -14.4 atm-liter. Work is done on the gas. (d) For the left side ΔU = (3/2)nRΔT = (3/2)PiVi(Tfl - Ti)/Ti ≈ 75 atm-liter. ΔW = 14.4 atm-liter, since the left and right side are always in mechanical equilibrium. ΔQ = ΔU + ΔW ≈ 75 atm-liter is the amount of heat absorbed by the gas. Let CP and CV denote the molar specific heat of an ideal gas at constant pressure and at constant volume, respectively. Show that CP - CV = R.
Let CP and CV denote the molar specific heat of an ideal diatomic gas at room temperature at constant pressure and constant volume, respectively. Find the ratio CP/CV.